How Much Compensation For Children’s Playground Accident Claims? Many accidents involving children occur at playgrounds and fortunately he vast majority of injuries are just minor and occur due to normal play activities. However, this is not always the case, and more severe injuries can occur if the party responsible for the playground has acted negligently. This could be the school, the council, or any other organisation or business. If your child has been injured in a playground accident that was not their fault, you could be able to claim compensation on their behalf. A guide to children’s playground accident claims. What is a children’s playground accident? What should you do if you or your child has been injured in a playground accident? Has your child has an accident in an adventure playground? Can you sue for playground accidents? What can be claimed for after a playground accident injury? Start your child playground accident claim. Injured at an indoor play area, do I have a claim? Child injured on school playground do I have a claim? Slip, trip, or fall in a children’s playground, can I claim compensation? What are the most common playground accidents? Children’s park play area accident claims. What evidence would I need for an accident in a children’s playground? Who can claim for an injury due to an accident at a children’s playground? Can a parent or guardian claim for lost earnings? 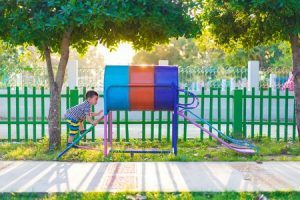 How much compensation can I claim for a children’s playground accident? No Win No Fee children’s playground accident claims. Why choose us for your children’s playground accident claims service? There is nothing worse than seeing your child get injured. While minor bumps and scrapes are to be expected, if your child has been injured while at a playground and it was not their fault, there is a high chance that you will be able to claim compensation on their behalf. To find out everything you need to know regarding playground accidents, from claims for school playground accidents to playground accident statistics, simply read on. The accident must have occurred due to the negligence, error, or carelessness of someone else. This will typically be the authority that is in charge of the playground. The accident must have occurred within the past three years. This is the time limit on personal injury claims, although there can be some exceptions when children are involved, so it is worth getting in touch if you are unsure. Your child must have seen a doctor for their injuries. This is something that we can arrange if they have not seen a medical professional yet. If you or your child has been injured in a playground accident, you should get the medical assistance required. This is important no matter how minor your injuries may seem. Not only is it vital in terms of your health, but also the medical report that has been put together will be used to determine how much compensation you receive. Then, all you need to do is give us a call and we will do all in our power to secure compensation for you. We always make an effort to secure the maximum compensation amount for our clients, enabling them to get on with their lives as much as is possible after the accident they have been involved in. If your child has been injured at an adventure playground, you will have the basis for a claim so long as the accident was not their fault. You will be able to make a claim against the authority that is in charge of the adventure playground. Such incidents typically occur due to poor maintenance, poor inspection, incorrect installation, unsuitable equipment for the intended age group, poor layout and design, poor equipment design, and failure to comply with Standards that are in place. If any of these have occurred, or any other type of accident has happened that was not your fault, we will be able to launch a personal injury claim for you and your child. The short answer to this question is yes; you can sue for playground accidents. When making a claim, the most important factor to determine is who is to blame. This is because your accident claim will be made against the authority or the company that has the responsibility of maintaining the playground. General damages – This payout is designed to cover the pain and suffering experienced. Loss of earnings – If you have experienced a loss of earnings while caring for your child, you will be able to claim for this. We handle claims for all types of playground accidents, so the only thing you need to do is give us a call to start the claims process. When you speak to a member of our team, they will happily answer any queries you have, and we always provide free consultations. During this first consultation, one of our legal advisors will embark on a fact-finding session. This will involve asking you a number of questions so that they can fully understand what has happened. There is nothing to worry about; this is simply designed so that we can provide you with the best advice for your case. We can also arrange a local medical for your child. Again, this is nothing to fret about. This is merely designed so that there is a professional medical report that details your child’s injuries, as well as the recommended course of treatment. This will be used to determine how compensation is awarded. Injured at an indoor play area do I have a claim? Schools have a responsibility to make sure that they provide a safe and healthy environment for all children and staff members. The playground falls into this statement as well. They must comply with government regulations, as well as playground standards, including the EN1177 standard for surfaces, and the EN1176 standard, which covers equipment. If the school has acted negligently or made an error, you will be able to claim compensation for the suffering your child has experienced, as well as the loss of income you have encountered while looking after your little one. undone or they weren’t looking where they were going, you won’t be able to make a claim. However, if they tripped because the surface of the playground was uneven, or they slipped because someone spilt oil when maintaining the equipment, you will have the basis for a claim. If you are unsure as to whether you are likely to receive compensation for the incident you or your child was involved in, all you need to do is give us a call and we will happily give you the full picture regarding your case. Poorly maintained moving equipment, for example, swings, zip lines, and roundabouts. Missing steps or footholds on high equipment. Exposed metal, wood, nails, or other sharp objects. Dangerous fencing such as barbed wire. Protruding obstacles that are a trip hazard. Uneven or hard flooring close to play equipment. Loose handles or seating on play equipment. Damaged play equipment with exposed sharp edges. This research should not be used to assume that swings are more dangerous. There are simply more swings at playgrounds than any other type of equipment. If your child has been injured in a public park or play area, the claim you launch will likely be made against the local council. This is because the council has a duty of care to make certain the play area is a safe place for children to play. It is, therefore, the council’s duty to ensure the play park area is inspected and maintained properly. If they have failed to do this, they have acted negligently, and you will have grounds for compensation as a consequence. A medical report – This is something your doctor will provide. If you or your child is yet to see a medical professional, we can arrange this for you. Details of the accident – As soon as you get the opportunity, jot down the details of the accident so you don’t forget later down the line. Take photographs – Photographs of the playground, as well as any injuries, can help to strengthen your case. Contact details of the perpetrator. Contact details of any witnesses – Witness statements serve as exceptional proof of what has happened. Proof of loss of earnings – If you have suffered any out of pocket expenses due to the accident, such as loss of income or counselling expenses, keep receipts and other documents that will prove this. If your child has been injured in a playground accident, you can claim on their behalf, and you can also claim for loss of earning suffered. If you don’t claim, your child has three years from the date of his or her 18th birthday to claim themselves. Finally, if you have been injured due to an accident at a children’s playground, you can, of course, launch a claim for yourself. If you have had to take time off work due to your child’s injury, and you have lost income as a consequence, you will be able to claim for this as special damages. If your child has been injured in a playground accident, you may be wondering how much compensation can be claimed. While it is impossible to give an accurate figure, as every case differs, we can give you an average amount of compensation for a playground accident. Take a look at the typical compensation payout amount for a number of different injuries below. If you cannot find the injury that applies to your case, simply give us a call. Loss of anticipated earnings £10,000 - £400,000 This is based on your current pay grade, as well as your future prospects. There is the potential for a higher maximum payout in some cases. Loss of benefits £5,000 - £500,000 This is calculated based on the actual income that has been lost. There is the potential for a higher maximum payout in some cases. Pain and suffering £1,000 - £200,000 The level of suffering and pain that has been experienced determines the payout amount. Very severe ankle injuries £38,050 - £53,000 Very severe ankle injuries are unusual and limited. This includes transmalleolar ankle fractures, with extensive soft-tissue damage, which causes a risk of further injury and deformity. Severe ankle injuries £23,800 - £38,050 Injuries where there is a lengthy period of being in a plaster or an extensive period of treatment. Moderate ankle injuries £10,450 - £20,200 This includes ligamentous tears, fractures, and alike, which give rise to disabilities that are not as serious as the above, for example, residual scarring, irritation from metal plates, awkwardness on stairs, difficulty walking or standing for long periods of time, and difficulty walking on uneven grounds. Modest ankle injuries Up to £10,450 This refers to undisplaced, minor, or less serious fractures, ligamentous injuries, and sprains. Severe chest injuries £76,500 - £114,100 This payout is for the worst type of case, which will be serious heart damage and/or the total removal of one lung. Prolong and serious suffering and pain will be present. Simple chest injuries £9,575 - £13,650 This payout is for relatively simple chest injuries, including those that cause some permanent tissue damage, yet no significant long-term effect on lung function. Minor head or brain injury £1,675 - £9,700 The level of award will be determined by the absence or presence of headaches, the extent of continuing symptoms, the period taken to recover from any symptoms, and the severity of the initial injury. No matter whether your child has been involved in a playground accident in a park, in a school, or anywhere else, you will benefit from our No Win No Fee service. All of our solicitors work on this basis. Under a No Win No Fee agreement, you are only going to need to pay legal fees if your case is a success. This means that you are never going to find yourself in the dreaded position whereby you have a huge legal bill to pay yet you do not have a compensation payout, and so effectively you would be significantly out of pocket. This can happen with other legal firms, but it won’t be the case when you work with ours. There are many knock-on advantages associated with the No Win No Fee payout. Not only does it offer your financial protection, but also it gives you the peace of mind that we only take on cases that have a genuine chance of success. If you were to opt for a solicitor that charged per hour, there is always the chance that they could simply take on your case in order to take your money. After all, they are not impacted by the outcome of the case. This is why it is always better to leave personal injury cases in the hands of a No Win No fee legal team. There may be many legal companies and claims management companies to choose from, but you will struggle to find an actual personal injury law firm that offers a better service than we do. We have many years of experience in the industry, and we have handled a number of playground injury claims over the years, successfully securing compensation for personal injury victims that have been in need. One of the benefits of choosing our service is the fact that we always put our clients first. You can be sure that our main priority is securing the maximum amount of compensation for you, and ensuring that the claim process is handled in the most efficient manner. We know that this is an extremely difficult period in your life, and the last thing we want to do is add to the stress you are experiencing. If you want to make a playground accident compensation claim, all you need to do is give us a call on 0800 073 8804. You will speak to a friendly and professional member of our team, who will happily guide you through the playground accident claims process and answer any queries you may have. Although rare, we can also assist if there has been a playground accident death, ensuring you get the fatal playground accident compensation you deserve. This link takes you to the ‘Playground – risks, benefits and choices’ research paper that was prepared by a UK University for the Health and Safety Executive. It includes information on play injury cases in the UK, types of injuries, assessing risks, and more. This link takes you to the ROSPA guide on accidents in children’s playgrounds. It includes details on the types of accidents, as well as playground law. Use this NHS page to find out what condition you could be suffering from, as well as the recommended course of treatment. How Much Compensation Can I Claim For a Child Injury? If your child has been injured find out how much compensation you can claim for your child, contact us for free legal advice and how to start a no win no fee child injury claim. How To Claim Compensation Against The Council? If your child has been injured in a playground due to the local council being negligent contact us today to find out if you can claim compensation and get free legal advice.